Hunter Blacke is an agent with an unnamed American agency. The bureau is not necessarily ultra secret, at least not as Blacke talks about it. He just does not give any clues about its title or location other than it is American. He also does not let on how long he has been an operative but it seems like a fair amount of time because his position is secure enought that he can annoy his boss without worry. As a cover for his real job, Blacke operates as a specialist in hotel reconstruction and renovation. He might work on other things, like restaurants and such, given the odd hint or comment but hotels, or resorts, are his mainstay and apparently he is quite good at it. He is also trained as a tour operator and expert in tourism which has to come easily since he travels the world already looking for places companies can build new facilities or ways to fix up sagging older places. For his official job, he would go to a region and study it so he might give advice to whoever was hiring him how best to build a hotel, market it to become known, and how to learn who the good guys in the area were and who were the bad guys. As he travels all over doing very legitimate work for legitimate companies, he can also take the time to handle assignments for his agency. His being an expert in fixing up damaged property comes in handy at the end of some of his missions because where he goes, bad things do to. "I was a shadow. Wherever I went chaos would follow," is how he put in once. While he was trained in close combat as well as ways of extracting information from people, willingly or otherwise, when it came to doing his job, his attitude was to gather the intel anyway necessary and then "get the hell out of the circumstance" without leaving evidence he was there. His success rate had to be good to be constantly called for but he modestly remarks that he felt his skill levels were "adequate to the task". One other thing beside travel and adventure that Blacke likes, and which he will spend a good deal of time talking about, is the food at the areas he visits. He adores trying new dishes and new beverages and then telling his opinion. These adventures are marketed as books so I put them in this section but in truth their size make them more novellas. They are very, very fast reads which, if you are looking for fast adventures, is not a bad thing. Hunter Blacke heads to Armenia to find out what happened to a satchel of diamonds the Israelis were providing to pay for reconstruction of Armenias' capital. They disappeared. 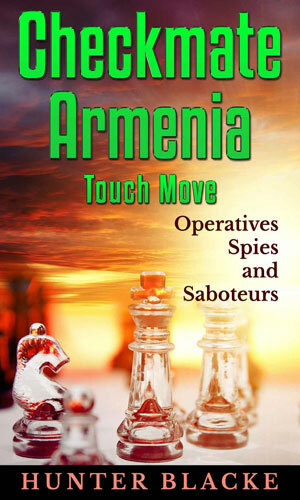 A World Chess Olympiad taking place in the capital of Armenia is a handy event to hide the meetings of two countries to discuss covertly important financial arrangements involving military arms. Hunter Blacke is sent there to disrupt those talks. 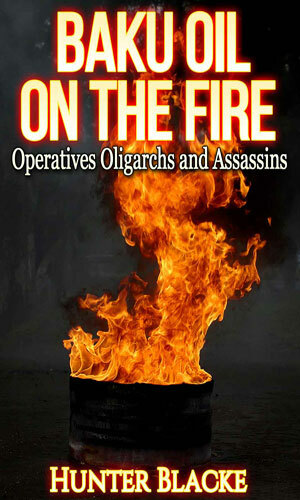 In Baku, Azerbaijan, a plot is underway to destabilize the oil production, causing billions to be lost there and made elsewhere. 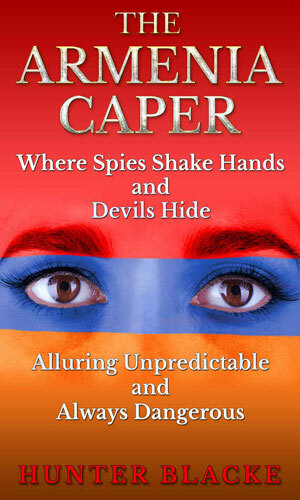 Hunter Blacke and an associate are sent to the region to find out who and stop them. 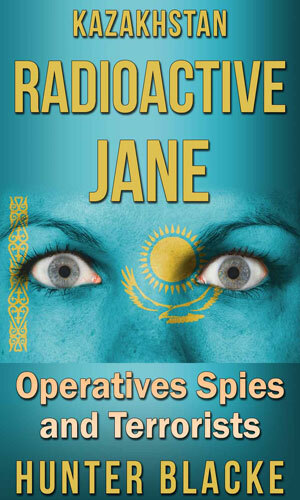 In Kazakhstan, a Central Asian Security Conference is the backdrop and cover for Hunter Blacke as he is sent to find out who stole a shipment of radioactive isotopes and who is out to buy them. 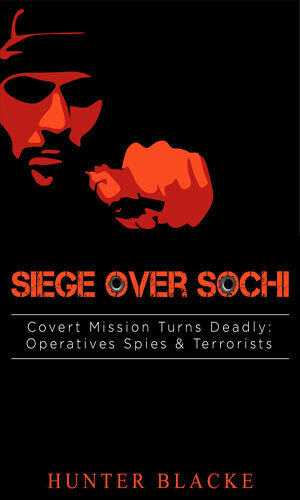 Shortly before the Russians host the Winter Olympics, Hunter Blacke is sent there under his hospitality expert guise to monitor the growing tension between Russia and Georgia. The highway between two cities in the southern Urals of Russia is a very dangerous place for truckers hauling military goods and armaments as many are hijacked. Hunter Blacke is sent to find who is doing it. These books, which elsewhere I mention are more oversized novellas, are extremely fast reads. They suffer badly from a lack of editting, either with grammar or pacing and more than once the author contradicts himself in the storyline. Not enough to cause trouble, mind you, but enough to be noticable and distracting. A character might enter a room, sit down, talk for a minute or two, and then be invited to sit and join the party. Again, nothing bad, just off. Having pointed out a flaw, I want to point out that Blacke has some quite interesting comments here and there that make reading the stories fun. He has a droll wit about him and since he is in foreign countries with people who do not know him, his side comments can slip by the people he is talking with but not the reader. They definitely add to the stories. One big plus this series has is the fact that the main character, being an experience tour operator, can really describe well the region of the Caucauses where the stories take place. The author does a very good job here. These stories could use some help but the author is improving over the six adventures.